Ok, so, I'll be the first one to admit that my experience with blue cheese is limited. Growing up, for the most part, we basically just had your usual deli cheeses, such as Swiss, Provolone, Cheddar, Parmesan, and good ol' square American cheese. Slowly but surely, though, I'm beginning to incorporate different types of blue cheese into my recipes. If you know me, you know that I love to watch and learn from Ina Garten, and she always includes some kind of blue cheese whenever she makes a cheese platter, such as Gorgonzola, Stilton, or Roquefort. So I got to thinking... I wonder how a blue mac n cheese would be? Well let me just say that this is one of the best ideas I've ever had! Not that I'm the first person to come up with this idea, but seriously, this was a moment of brilliance, I must say! Now, I know you might be a little hesitant to add blue to a mac n cheese because it has a much more pungent flavor than many cheeses, but it really mellows into a deep rich sauce that goes perfectly with the macaroni. It is AMAZING! 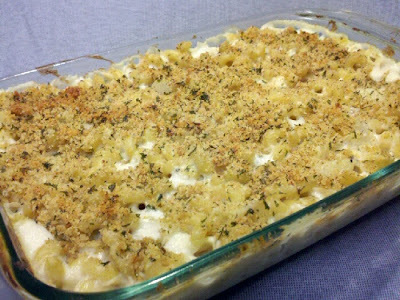 It's sort of a little bit more elegant than your usual mac n cheese, but it's still warm and comforting at the same time. And as Miss Ina would say "Who doesn't love that?" Bring a large pot of salted water to a rolling boil. Add the pasta, give it a good stir, and let it boil until it's tender. In the meantime, make the sauce. Melt butter in a sauce pan. Add onions and cook over medium heat until they begin to soften. Add the garlic. Continue to cook, stirring often, for a good 5 minutes, making sure the heat isn't too high. You don't want to scorch the garlic. Add the flour. Stir it well, and cook for another few minutes. Now add the milk, cheeses and salt and pepper. Stir it often, making sure it doesn't burn on the bottom. The sauce will become very thick and rich. Remove from heat and set aside until pasta is cooked. When the pasta is done, drain it well, and pour into the casserole dish. Pour sauce over the pasta. Give a little stir to make sure all of the pasta is coated. In a small bowl, melt butter in microwave. 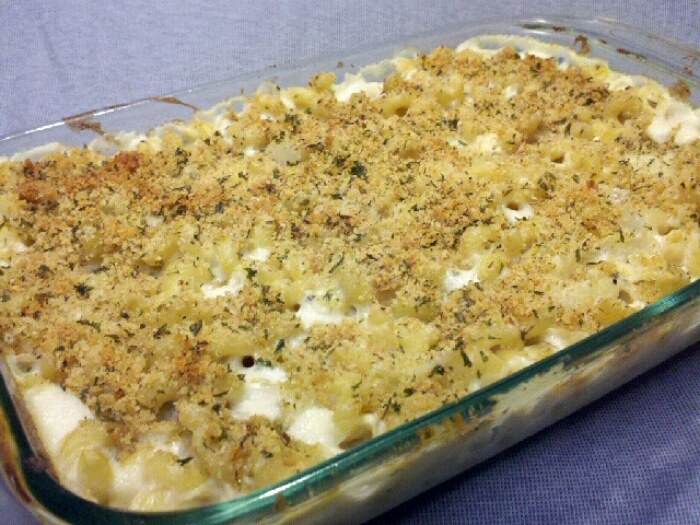 Toss in the bread crumbs and parsley. Stir until coated with butter. Sprinkle across the top of the pasta. Place in oven and bake for 20-30 minutes, or until lightly golden and bubbly. Let it stand for 5-10 minutes before serving. Be sure to generously salt the pasta water. It should be as salty as the ocean. I always use Kosher salt because I think it has a MUCH better flavor than regular iodized table salt. I used whole milk, but you can use any milk you like. Since this is sort of a more grown up mac n cheese, choose a shape of pasta other than elbows. I used cavatappi, just because I love the little cork screws, but penne would also be perfect. How many of you thought that this mac n cheese was gonna be BLUE in color? Hmm? ?